Happy Wednesday, People!! We're half way through the week!! 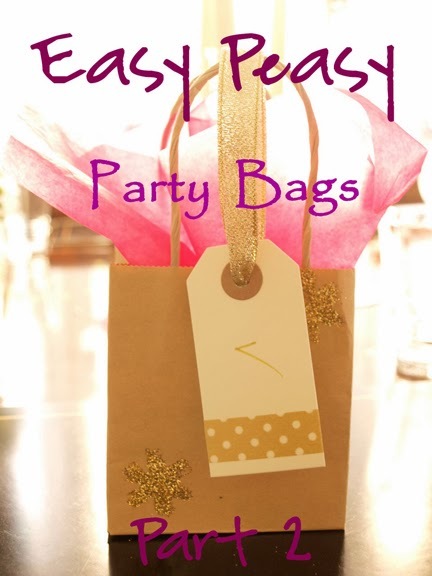 On Monday, I blogged about children’s party bags – now here’s the adult version! Last month it was my sister’s big three-oh and she decided that she wanted a small intimate dinner rather than a big bash. So with only 10 guests it meant that I could really go to town on the details without it taking hours. Again I purchased these small brown gift bags from Hobbycraft. Using a snowflake stamp coated in PVA, I stamped each bag three times in different patterns. Then I shook gold glitter over each gluey snowflake and allowed a couple of minutes drying time before shaking it off and doing any touch-ups. Once the bags had dried over night, I repeated the process on the back of each one. To each bag, I added two packets of Chocolate Slab. 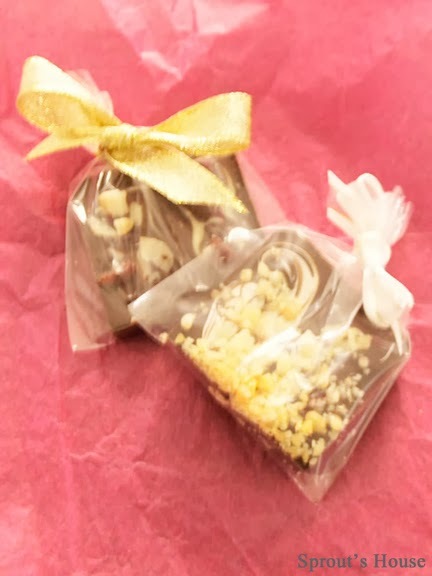 One flavoured with sour cherries and macadamia nuts, and the other with popping candy. I also added a couple of party poppers! The finishing touch was to add a simple white name label that I customised using gold washi tape and a gold pen. 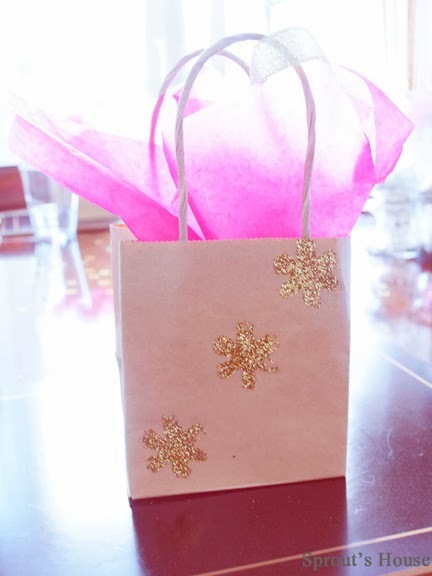 These were tied on using gold ribbon and the top of the bag stuffed with hot pink tissue paper. 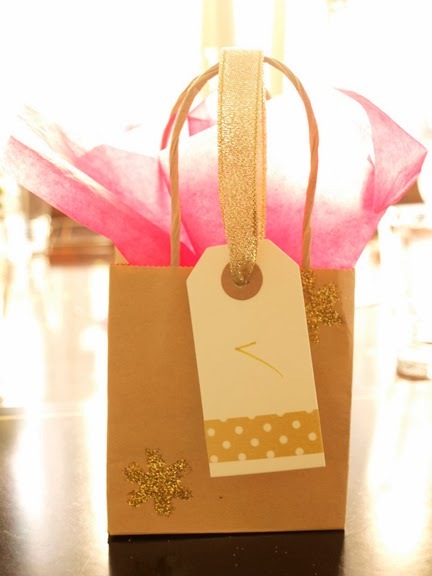 Et voila – super sophisticated grown-up party bags! How lovely, I have always thought maybe us grownups should get party bags once in a while! When I was a kid we got a slice of cake wrapped in a paper napkin and a balloon on a string to take home from a party if we were lucky. I love what you filled them with too. Thanks Julia - the guests all seemed to like it!! These look and sound great. :) Thank you for posting this.